Random Dumb Sh*t / Pop Culture / News Anita's Animal Adventures: Chapter 1  "Going Batty"
Our resident Listings Editor, Anita Overcash, loves animals. No. I mean, looooovvvveesss animals. And she seems to have encounters with critters all the time  like, way more than the average human. As a result, we thought it only made sense to have her start blogging about her meetings with creatures (both great and small) in a news series of blog posts titled: "Anita's Animal Adventures." I have a tendency to stay up much longer than I should during the week (concerts, movies, TV, socializing, exercising, and browsing Facebook, all contribute to keeping me occupied and not sleeping). This leads to the usual downfall of me being rather sleepy and of course, wondering sometimes whether or not Im losing my mind. So, it should come as no surprise that when I was awakened early in the wee hours of the morning by strange scratching type sounds outside my bedroom window, I was confused and alarmed, as I hurriedly stumbled out of bed and let my eyes adjust to the darkness. Looking out the window, without my contacts in I didnt see very much. I was, as the ol saying goes, Blind as a bat. I did see the shape of a small creature fly past by window and then to my astonishment hit my window head on. "OK, that kind of freaked me out." So, I decided to hop back into bed for some ZZZZs and to ignore whatever was capturing my attention. One thing was for sure: It was still dark, and I wasnt going outside to check it out until daylight. So what was it? Well, the next morning I saw nothing as I stood outside of the house and stared up at my bedroom window, located underneath the gable vent of the attic, which my room sits under. Later, however I would learn from a large amount of poop (yuck!) in the driveway below (and a family member's exploration of the attic), that what I had heard and kind of seen was a bat. But, there wasnt just one hanging out near my room. More than 50 of the small creatures were taking refuge in the gable vent I had stared at earlier and thought was "way too small for any creature to fit." From research I have done since this animal adventure, I have learned that bats love small, hard-to-get-into spaces. It makes them feel safe from predators while they are sleeping. Ahhh ... isnt that what we all want? 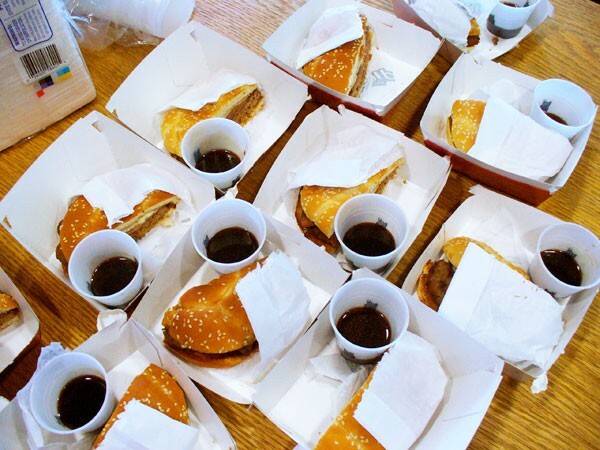 The fast food burger company Hardee's paid a visit to the offices of Creative Loafing a few minutes ago  the visit was part of a marketing blitz for the joint's new French Dip Thickburger. Hardee's sent over a bunch of burgers ... and four ladies dressed as french maids to introduce us to their new line of burgers. Now, I personally don't eat at fast food spots too much anymore (trying to get sexi-fied)  except for those nights when I need some grease to cut through the alcohol in my belly  but I don't turn down free food. I also don't turn away women dressed as French maids, youknowwhatI'msayin'? How do they taste? Well, it was free, so that skews judgment a little. But, they were pretty tasty. All in all, however, I think I liked the French maids more. Random Dumb Sh*t / News @Twitter What is #GoRoadDogs? Can someone please tell me why/who/what GoRoadDogs is/are and why it is a trending topic on Twitter? I'd really love to know! A spoof on Facebook, Lamebook.com features the lamest of the lame stuff people post on Facebook. I am looking at it right now and I am so LOLing. If you've got some time to waste, check it out. It's bound to elicit a few laughs ... at other people's expense. The names and faces of these lame-os featured have been blurred out. Hope it's not you. 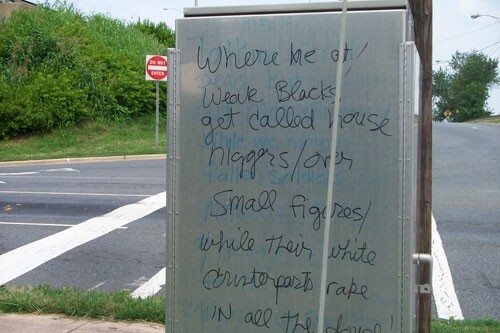 Charlotte, somebody is mad at blacks and whites and it's written all over Uptown's utility boxes. I wonder how long will it before this ends up as breaking news on TV. Better yet, when will this get washed away? If you want to see these boxes for yourself, start on 12th Street. The hype about the swine flu or H1N1 has died down, but with the grilling season about to kick off this weekend, you'd better know who the grill master is and if there is running water nearby. First, I'd avoid eat at anyone's house who treats their pets like a member of the family. Dogs and cats don't belong on the counter top when food preparation is going on. Next thing you know, there will be an outbreak of the Doggie Dog flu. Second, make sure the person cooking is clean. This includes hands, face and most of all fingernails. Heat does not kill everything! Third, it's all right to say no, no thank you and if you have to, HELL NO! Some people are just nasty, but they have the best beer in town. Or maybe you got roped into attending this gathering and you already ate. You don't have to risk you health to make a nasty cook feel better. Besides, there's no virus named after beer and if you didn't see the cook wash his or her hands, how do you know they didn't just touch their booty? Have fun, but make sure you don't catch a disease and pass it along to the rest of us! Hannity is such a jackass. If Oliver North jumped off a cliff -- oh, never mind. The debate over torture is getting personal for two of cable TV's prime-time hosts. After Fox News Channel's Sean Hannity made a seemingly impromptu offer last week to undergo waterboarding as a benefit for charity, MSNBC's Keith Olbermann leapt at it. He offered $1,000 to the families of U.S. troops for every second Hannity withstood the technique. Olbermann repeated the offer on Monday's show and said in an interview Tuesday that he's heard no response. 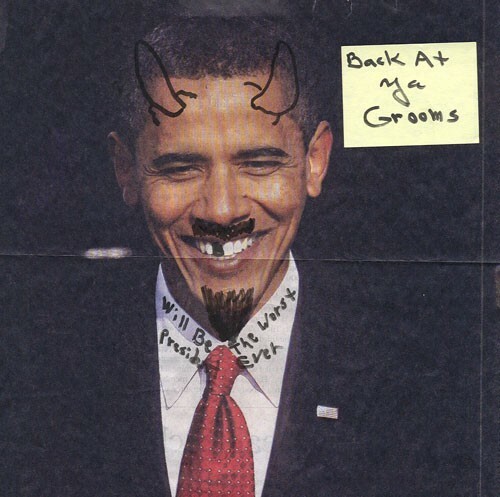 He said he'll continue to pursue it. "I don't think he has the courage to even respond to this - let alone do it," Olbermann said. 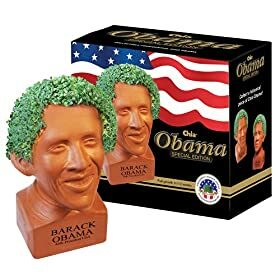 Amazon.com is offering this bust of Obama with Chia hair for $20. "Full growth in 1-2 weeks" touts the product description. Read the mixed consumer reviews here. The name of the web site Hot Chicks with Douchebags pretty much sums up what it's about: Pictures of hot chicks with total and complete DBs along with commentary. 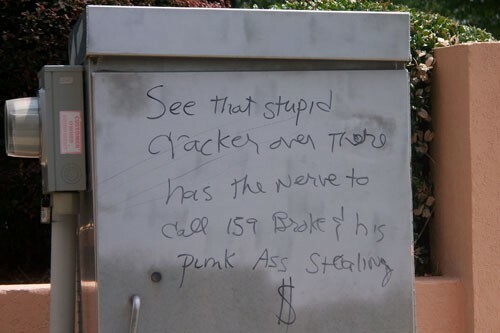 I'm assuming this was sent in reference to last week's Boomer With Attitude column.